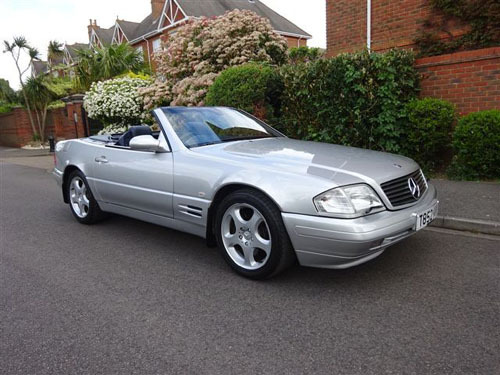 MERCEDES-BENZ SL320 V6 (R129) 1999. Brilliant silver with matching hard-top and Navy blue hide interior. Navy blue Soft-top. 17 inch alloy wheels. 47,500 miles only from new. Air conditioning, electric heated front seats, powerfold electric door mirrors, Blaupunkt Koln stereo, cruise control, wood/leather steering wheel. Comprehensive main dealer service history.